Posters, Bullhorns And Skirts Help Spread The Word About Vaccines : Goats and Soda One in five children in the developing world misses out on routine immunizations. How do you recruit them? With town criers, public notices — and even a call to action emblazoned on a garment. These two Portuguese language posters are pro-inoculation. 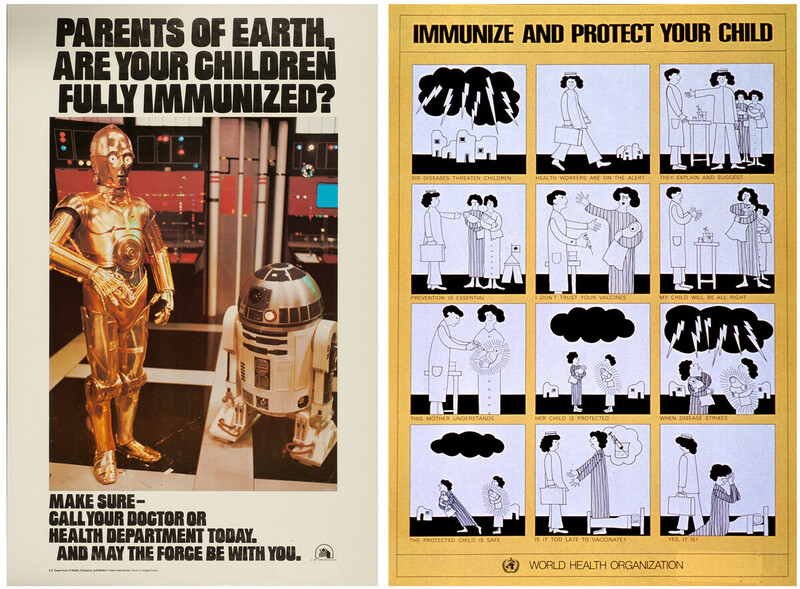 The one at left, produced in 1977, says, "Vaccinate and protect the children." 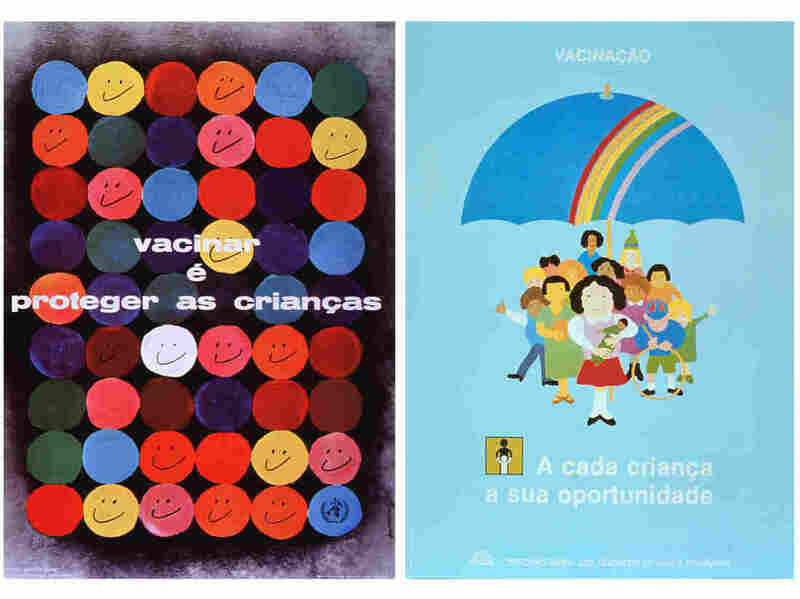 The one at right, from '87, sends a similar message, noting that vaccination offers an opportunity for every youngster. Imagine a town crier walking down the street outside shouting through his bullhorn: "All of the young people should go get the new meningitis A vaccine." And adding that it's free. That's one of the ways that health practitioners are combating what they call "vaccine hesitancy" — refusing a vaccine when it is offered or available. It's a topic that has made headlines this year, when an outbreak of measles focused attention on U.S. parents who'd not vaccinated their kids, fearing unproven side effects. In the developing world, meanwhile, estimates are that 1 in 5 children miss routine immunizations, leading to 1.5 million deaths a year from preventable diseases. That point was made in the journal Vaccine, which released a special issue on the topic earlier this week, written by vaccine experts at the World Health Organization. "Immunization programs must be able to achieve and sustain high vaccine ... rates," says Dr. Philippe Duclos, senior health adviser for WHO's Immunization, Vaccines and Biological Department and guest editor of the special issue. "Vaccine hesitancy is an increasingly important issue." There's a big push to improve the situation. The World Health Organization hosts an annual World Immunization Week each spring, and this year's theme was "Close the Immunization Gap." Reasons for the shortfall, according to WHO, include inadequate supplies, inability to connect with health services, insufficient political and financial support and a shortage of accurate information about immunization. So yes, a town crier is a good idea. In 2010 in the villages of Burkina Faso, town criers like Amadou François Dipama lifted their bullhorns to announce the MenAfriVac vaccine, developed by the World Health Organization and the nonprofit group PATH to target meningococcal A meningitis. The infection has killed tens of thousands, many of them children, in sub-Saharan Africa and left hundreds of thousands with hearing loss and other health problems. Dipama's peak hours are 3 to 6 p.m., when parents and children are coming home from work and school. They're likely to hear him as he bicycles or walks through the village, making announcements about dances, town meetings, and — in 2010 during a vaccine campaign effort — about meningococcal A meningitis. In Burkina Faso, the meningitis vaccine campaign became one of that country's most successful public health interventions. Eleven million people, age 1 to 29, were vaccinated within 10 days. The bullhorn announcements were backed up by community health workers who went door-to-door, explaining the vaccine: How it's given, why it's important and what its side effects might be. Zainab Aki, who works to convey messages about Ebola in Sierra Leone for the WHO, says it's key for health workers to keep answering "until the questions have stopped." If people still have questions, says Aki, they are unlikely to come for the vaccine. "Cultures, leaders and messaging are different in each country," says Amrita Gill-Bailey, a team leader at the Johns Hopkins Center for Communication Programs who has worked on vaccine campaigns in the developing world. "So you have to study and use what's most likely to work in order to build trust that the vaccine will be helpful." The Centers for Disease Control released the Star Wars poster in 1977. In the grim poster at right, from the World Health Organization, lightning bolts symbolize childhood diseases. One mother vaccinated her child. The other did not; her child dies of a preventable disease. That could mean vaccine promotion via posters, bumper stickers, videos and storybooks. Several organizations, including PATH, a Seattle-based nonprofit that works on vaccines, offer poster templates that communities and organizations can adopt, like these two to prevent Japanese encephalitis, a mosquito-borne virus found in Asia that accounts for close to 70,000 cases and over 24,000 deaths each year. Rotary International, which has made eradicating polio its mission for decades, has paid to have vaccine announcements added to the traditional, colorful, wraparound skirts of Kenyan women. Messages in English and Swahili on the skirts, which sway as women walk, read "Give Children the Gift of Life." The goal is to get passers-by to ask what that gift is. There's a dramatic flair in some vaccine messages. To recruit volunteers for an experimental hookworm vaccine in Brazil in 2007, a "community preparedness team" of trained health workers staged skits for kids and parents in which dolls were vaccinated with toy medical equipment, says David Diemert, director of clinical trials at the Sabin Vaccine Institute in Washington, D.C. The newest challenge for vaccine community preparedness teams is to get volunteers for the Ebola vaccine trial now underway in Western Africa. Early reports of success made the news last month but additional testing is crucial. The trial was given a catchy name — Ebola ca suffit (Ebola that's enough) — to encourage participation. Brochures include photos of people being inoculated by gowned and gloved health care workers to help dispel fears. Health care workers speak with potential participants to answer questions about pain (it's just like a pinprick), effectiveness (extremely promising in early trials) and side effects (under investigation). The teams know there's work to be done. Despite Ebola's devastating toll, a third of eligible participants for the vaccine trial in Guinea chose not to participate.